I was watching a news story piece on an American cars in Iran. Years ago they stopped allowing American cars to be imported into their country. The government wanted their country to invest in their own cars so they stopped it completely. Even though the American cars were no longer coming in, there were people who still had possession of American cars. They didn’t just own any cars, but cars that we would consider classics today. 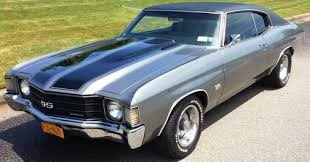 One car that the reporter observed with an Iranian owner was a 1972 Chevy Chevelle. He had rebuilt and restored it from scrap and it was in great condition and a beauty to look at. Isn’t that interesting? To the owner, it didn’t matter how many miles this restored and rebuilt car could give him. He loved it for what it was and didn’t care what it could give in return. He loves you and me no matter what we provide in return. Often times, in spite of what we return. Be glad and hold onto the truth today that the Father loves you and it is that love that overrides anything we can do to earn love. He already paid that price for us. Receive His love today my friend.